Do you guys ever have those projects that sit on a long list or in the back of your mind and it’s so far down on the priority list that you never think you’ll actually get to it? And then all of the sudden, out of the blue you decide to push aside all your other projects to tackle a monster project because it sounds fun? Did that make any sense at all? Let me explain. You see our two big kids share a jack and jill bathroom. (You can see some basic decor updates I did here) There is nothing wrong with the bathroom, it’s just a very basic nice builder grade bathroom. But I want to take it from basic to WOW. And I think I can do it with a few ‘simple’ changes. I use the word simple loosely because anytime you are about to paint cabinets and start tiling you enter into larger DIY projects but it’s better than ripping everything out right? I’m in the very very beginning of the planning process but things are going to move super quick on this project. 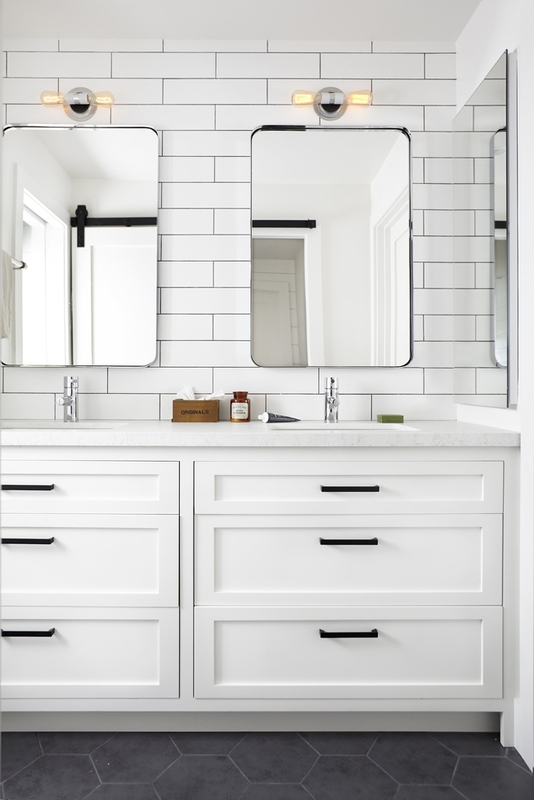 I’ve been gathering tons of inspiration and I thought I’d share all the Double Vanity Ideas I’ve been collecting. I have about three different color palettes I’ve pulled together and I’d love your thoughts! This amazing space from My Life From Home has been at the top of my bathroom list for a long time now. What I love about this space is how she perfectly mixed the different patterns and textures. Obviously the tile backsplash is the huge statement piece of the space. 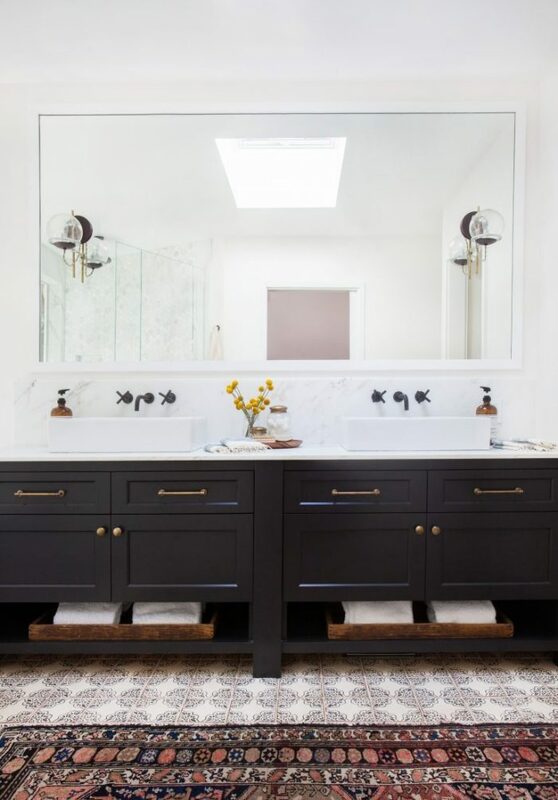 I find myself really drawn to the patterned tile trend that’s been going on for a while now, but my biggest fear is that it’s so bold and trendy that I’ll want to change it out in a few years and that won’t be very easy. Thrifty Decor Chick also did her bathroom in this tile and wood mirrors and it still stops me in my tracks. Also a favorite. Now let’s move onto another look! The crisp clean look of this bathroom is so dreamy. Decorist really knocked it out of the park on this one. I seriously love every single detail in this bathroom from the large hexagon tile, cabinet style and industrial mirror and lights. My ONLY issue is that I don’t think the white cabinets will hold up well with three little kids, but our kitchen is fine so maybe it would hold up ok? 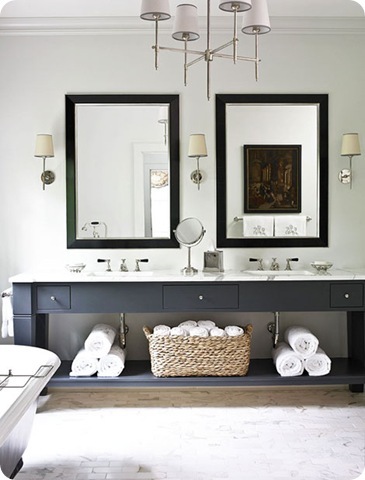 Here is another black and white bathroom by 2to5 Design . Obviously, the black and white are what I am instantly drawn to and I love the little duckies for the little kids. We aren’t planning on changing the vanity so these won’t work, but that wood color is so gorgeous with the black and white. Same situation with these amazing bathroom from Magnolia Homes. If I was gutting the bathroom I would probably end up with something along these lines. 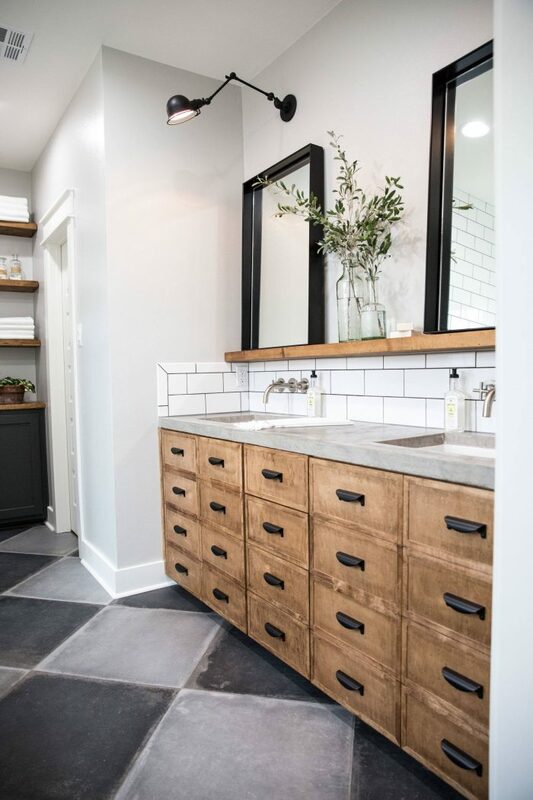 This apothecary style vanity is perfection and I love the industrial farmhouse style of the whole bathroom. Ok let’s move onto my next color choice for the vanity, blue! This is a little bit of a stretch for me, but if I use any color in our home it’s navy blue and since this is a kid’s bathroom I thought I might make it a little more fun and different than the rest of the house. 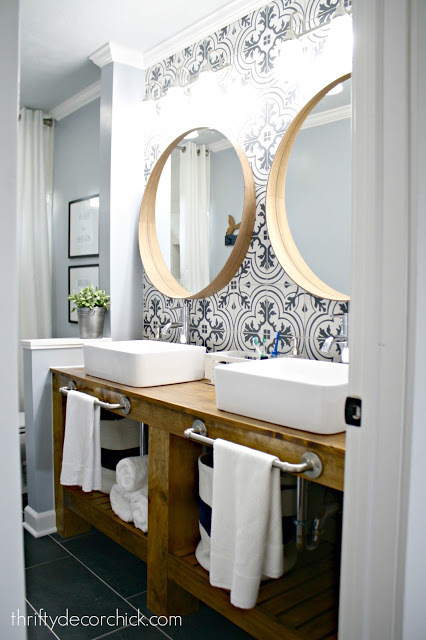 Amy Morris Interiors chose a really pretty subtle blue for this vanity and I really like it. It’s dark enough to be a gray but also blue enough to stand out a little bit. 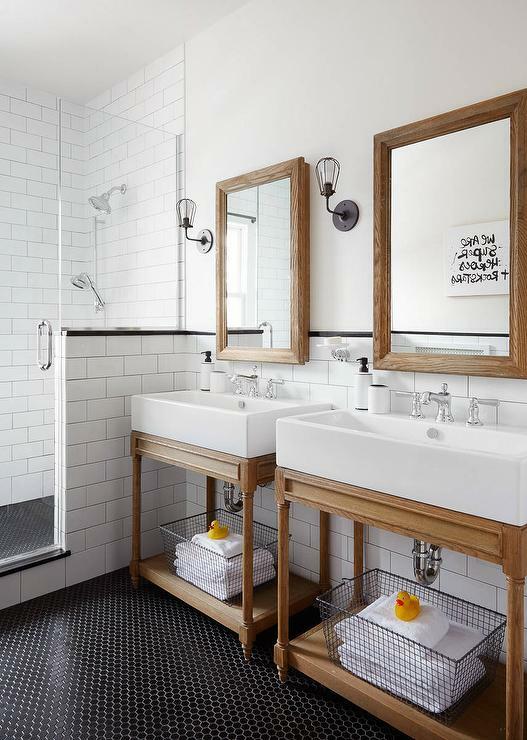 Maison De Pax completely killed it with this bathroom makeover. 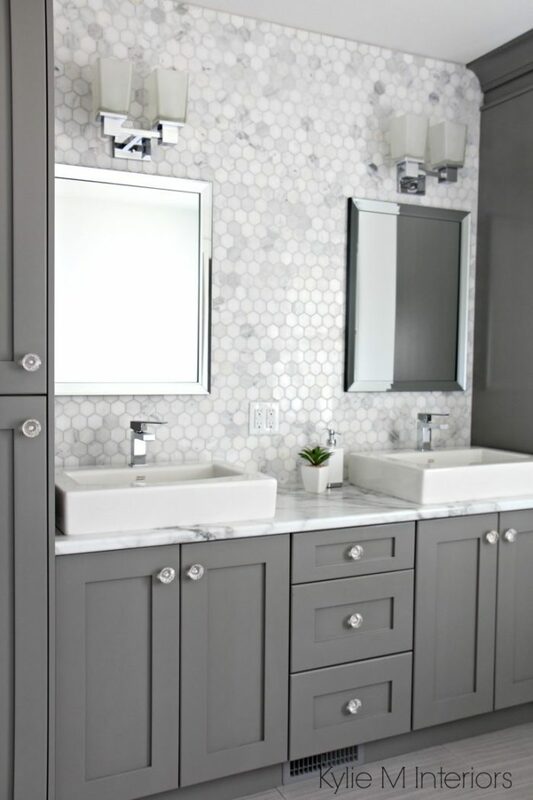 I wanted to show you this bathroom because of the hexagon tile which I am highly considering, paired with the blue vanity and white subway tile. It’s really classic but also bold and trendy at the same time. Now my next vanity color option would be this dark charcoal gray. I really love how Sonoran Dessert Living added the patterned tile to the floor and then the wood backsplash. 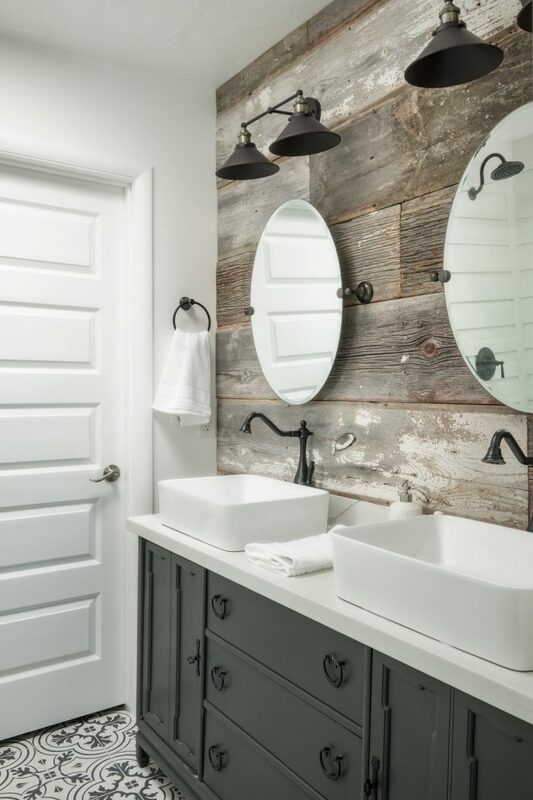 I would incorporate more modern fixtures and accessories if I went with this more rustic look, similar to what Joanna did in the bathroom above. My original idea was painting the vanity this dark gray/black color. 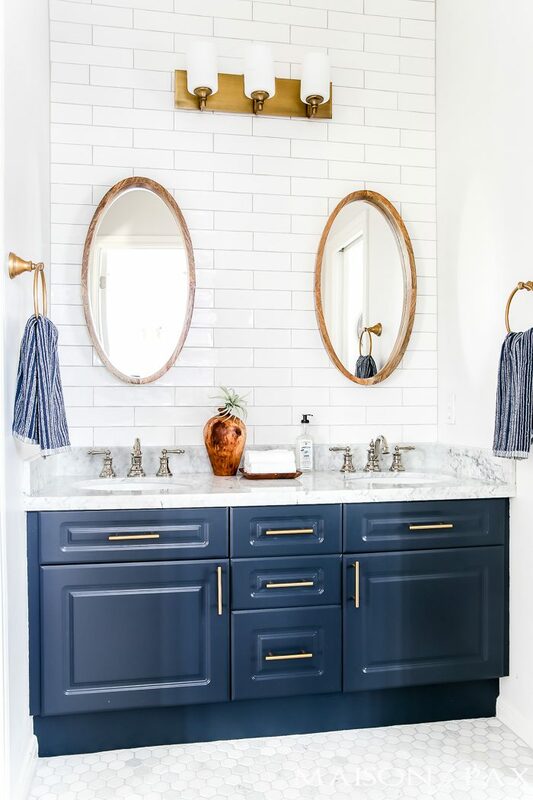 This bathroom by Amber Interiors is a gorgeous boho modern style, mine will be a little different but I wanted to show you the vanity color paired with the white backsplash and wood accents. Lastly, let’s look at this hexagon tile one more time . Kylie M Interiors use it for her backsplash and I’m really loving it. You guys, these are ALLLLL such gorgeous bathrooms, how am I going to narrow the style down?!? I could go so many ways. I think at the end of the day, you can’t really go wrong with any of them. It’s just finding the right style for our house and picking a style that will last for many years to come. And if you need a reminder, here is the current state of the bathroom! 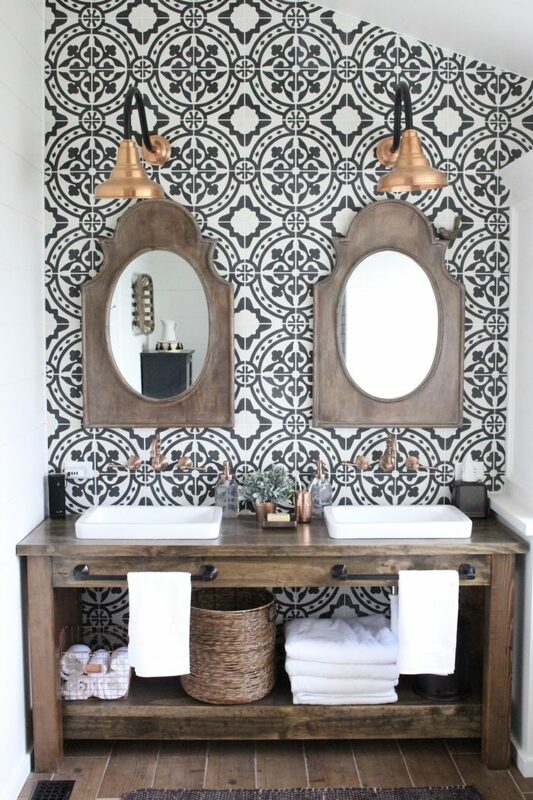 WHAT IS YOUR FAVORITE VANITY COLOR AND TILE COMBO? I like the crisp clean look by Decorist the most. That look feels timeless to me, and I’m too practical to have exposed shelves instead of drawers. I agree! I am SO drawn to that look, it’s one of my very favorite bathrooms. I just don’t know if it’s the right one for kids? And we are keeping our existing vanity that has cabinets and just having it painted. I need the storage too! I personally love at most the vanity from pic 1 and the wood backsplash from the last pic. Maybe using both it’s too much dark wood so I would stain the wood backsplash white for more contrast or I would take the usually used subway tile patterns in white or maybe grey. The backsplash from pic 1 is very specific and not the right choice for a kids bath in my mind. Funny, but without looking where these designs came from as I was scrolling through them my favorite was the Magnolia bathroom! I love different aspects of them all but overall if I had to choose one complete it would be that one! I LOVE that one too! And Yes, I really like different aspects of each of them. I think the final product will definitely be a combo! I think you found all the fabulous bathrooms, doing so, makes its impossible for me to choose. All of these bathrooms stole my heart. I truly love them all, and would be extremely happy with either one. So beautiful!